Fort Wingate is near Gallup, New Mexico. There were two locations in New Mexico that had this name. The first one was located near San Rafael. The current fort was established on the southern edge of the Navajo territory in 1862. The initial purpose of the fort was to control the large Navajo tribe to its north. It was involved with the Navajo's Long Walk. From 1870 onward the garrison was concerned with Apaches to the south and hundreds of Navajo Scouts were enlisted at the fort through 1890. 1860 A temporary post, Fort Fauntleroy, was established at Bear Springs (Ojo del Oso), a place visited by Navajos. 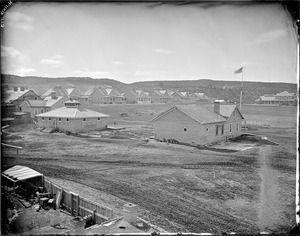 Later it was renamed Fort Lyon, when General Thomas T. Fauntleroy, for whom the fort was originally named, joined the Confederates. 1862 The post was renamed Fort Wingate after the abandonment of an army post of that name located sixty miles away in San Rafael, New Mexico. It was named for Major Benjamin Wingate, 5th U.S. Infantry, who received wounds to his legs during the Battle of Valverde. September General Edward Canby ordered a new fort to be placed at the headwaters of the Gallo River. It was designed to house four companies of troops. 1864 Colonel Kit Carson was ordered by Canby to bring four companies of the First New Mexico Volunteers to the fort to control the Navajo. 1865 there were 3,089 troops in the New Mexico Military District, 135 at Fort Wingate. 1873 - 1886 Participated in Apache Wars with troops and recruited Navajo Scouts. 1878 there were 137 troops at Fort Wingate. Was asked to settle disagreements between Navajo and citizens in New Mexico 1868-1895. 1918 Fort Wingate focus turned from Navajo to World War I . 1940 Used to store munitions from World War II onward. 1993 the Base Realignment and Closure Act (BRAC) closes the post. Environmental cleanup and land transfer to the surrounding community continues to the present day. Second Lieutenant Cornelius C. Smith, a Medal of Honor recipient, poses with his favorite horse, Blue, in front of his quarters in 1895. Several famous military commanders cycled through Fort Wingate's history. 1881-85 General Douglas MacArthur lived at the fort as an infant, with his father who was a Captain in command of Company K, 13th US Infantry. 1889-90 General John J. (Black Jack) Pershing served as Lieutenant at the fort. The above extracted from (AMCIS-102 dated 1 July 1970 Ft Wingate). ↑ San Rafael is at 35°06′45″N 107°52′58″W﻿ / ﻿35.112466°N 107.882652°W﻿ / 35.112466; -107.882652.
http://www.astronautix.com/sites/forngate.htm Includes chronology and launch log. http://www.globalsecurity.org/military/facility/fort-wingate.htm Includes comprehensive history on Fort Wingate.